I was fortunate enough recently to attend LeanCamp, an unconference organised by Salim Virani and aimed at people interested in the Lean Startup meme. I was reminded the other day of one of the sessions I attended. “Lessons Learned Bootstrapping a Service Company” was run by Chris Parsons about his experiences in starting his company, Eden Development. Of the conferences that I have been to recently, I’ve found myself gravitating towards sessions that take an experience report format more. I like them as they’re nothing more than observational. Whilst they do often focus on one subject in particular the people presenting are giving you an opportunity to listen to their experiences, good and bad of trying to do something one way or another and not just trying to sell you a mentality / ideology. I do find sometimes that they let themselves down in the respect that evidence provided of the effects is anecdotal instead of quantitative. Happily, this was a less formal session and so that wasn’t a concern. At 7digital we’re starting to near the end of the first phase of a project that is large in comparison to the normal size of those that we do. To be specific, we’ve been involved in the project since June last year and have been actively working to deliver features for the client since early November. It has consumed at a minimum, 4 developers full time and for a couple of months, 8. As I suggest, not large necessarily in comparison to other projects within the industry, but large for us. I was reminded of Chris’ session as I start to reflect on what I have learned in delivering this project. Chris outlined 5 key lessons in a slide deck and then spoke about them. I thought that I might use those headings as the basis for my own blog post in respect of what I have learned. Chris’ point in the presentation was that he wished that he’d learnt to say no more often to pieces of work that he took on in the formative stage of Eden. I’m certainly not in a position to be able to make those decisions outright at 7digital nor for that matter would we as a company want to; we’re in a privileged position that allows us to work with some great clients on interesting pieces of work that suit all concerned. In the case of this project in particular owing to the client’s incumbent delivery process, we’ve had to accept that we have to work in a way that is contrary to the way in which we’re happiest delivering software. In contrast to Chris’ point, I think what I’ve learnt or at least had reiterated to me, is that saying yes to something but in doing so asking why, is very powerful. On a number of occasions I’ve been able to ask why a practice is used and in doing so understand 2 things; the context that surrounded the practice and secondly, the way in which the practice is viewed. With those bits of information I’ve been able to bring some subtle but nonetheless tangible change to the project and hopefully have contributed to making it more successful as a result. I don’t have notes that have the specifics of Chris’ points here but remember agreeing wholeheartedly with him. I think he made the point that there was a correlation between those that were passionate about development and the breadth of their skill set and ability to pick up say, a new language. There isn’t really anything within this point that I can speak about that isn’t only tenuously linked and so I am leaving comment in this section. On this point, Chris spoke about the fact that at Eden, rather than having invested in tailored office space from the outset as so many other startups do (along with presumably, micro scooters / space hoppers / foosball tables etc), they invested in things that mattered such as decent chairs and machines for their staff. In deference to our typical approach to development, on this project we did a lot of up front analysis, some 2 or 3 months, which at the time felt a little uncomfortable. Reflecting upon this now I think we did about the right amount and instead of just documenting requirements we spent a lot of time challenging them in order to understand the problem that was attempting to be solved. We asked the client to give us ways in which we could measure success of the software we were to deliver and most importantly, we tried to understand what the smallest piece of work we could do for the client to suffice their requirement. This is not to say that we’ve done half a job, far from it. I think that whilst we were constrained to an extent by the project bias this piece of work took, we have attempted to embed an incremental approach where possible. I think that this effort was worth the investment of our time and money, we haven’t to date included the work done in any bill but it has paid for itself in my opinion. We ended up with a very discreet set of functionality that services a requirement and nothing more. We didn’t end up developing software that isn’t going to be used and the software that we have delivered is in the most part, measurable aiding our desire internally to automate all of our acceptance tests. Here, Chris spoke about how having some savings as a company has helped Eden move from a position where they were chasing all types of work even that that was underpaid to one where they can afford to be a little more selective about the type of work or the clients that they work with. For us in respect of this project, it’s certainly not work that we would have turned away. It has been a great piece of work to be involved in. My main lesson here has been that there is a hidden cost often not consider associated to development of this size in a department the size of ours. As I stated at the beginning of this article, this project has utilised up to 8 developers for a time which equates to roughly a third of the department. Because of the way the department is structured, we have 4 product teams and the fact that this work spanned 2 of those, it heightened the need for effective communication and the need for collaboration between the teams which has a cost associated with it. When considering work of this relative scale again, I will be sure to consider that fact. There is also the matter that undertaking a large body of work such as this for us could have presented problems in our ability to undertake other smaller pieces of work; we might have missed out on opportunities elsewhere. Thankfully we haven’t, or at least we haven’t noticed any that we have. Finally, Chris spoke about the fact that in setting up Eden his desire was always to be building great software for clients. He went on to say that building a company is made up of a thousand small decisions and that it’s important to let the people who work for you to make those decisions though the only way that that would be successful is to have a clear vision that everybody knows and understands. He suggested that he has been known to “pop quiz” people within Eden on it. In the Development Team here at 7digital we’re continually striving to produce software that is the right thing and is to a high standard of quality. From the moment that we set out on this endeavour we have strived aided by the Green Field nature of this work, for sure, to deliver against those aspirations and based on the measures that we have in place internally, I think we succeeded. One example that I would cite is this; we found that there was a misunderstanding owing to assumptions within everybody’s understanding of our acceptance criteria for one of the features. Unfortunately this wasn’t caught until fairly late on. Given that we had a suite of unit, integration and system level tests we were able to quickly understand the impact of this new requirement and go on to make the change. Having worked on many different projects throughout my career I’ve rarely before been afforded such confidence that a requested change would be successful and have so little impact. Anecdotal evidence I know, but enough for me in this case. This entry was posted in agile, lean, work and tagged experience report, large project, leancamp, lessons learned, services company on 8 June, 2010 by danrough. Recently, I’ve been working closely with one of the teams here and consequently have lead some changes to the dashboard that they keep for use in their planning sessions with stakeholders and for my benefit in being able to track costs associated to any client development we’re doing. Having been keeping the data in this team now for about a year it’s proved incredibly useful. Owing to the nature of the stakeholders that provide direction in respect of the teams’ pipeline, we’ve often seen situations where new features have been prioritised over features that have been in the backlog for some time, something that is quite normal I’m sure. In turn though, this has then meant that when the team does come to start the work pertaining to the features that were entered in to the backlog first, the delivery date that was originally suggested to the external client will have already passed. In those cases, whilst the feature has been estimated using “T-Shirt” sizing we’ve only then tracked how long the team took to do the work. This is not a problem in itself, but a recent observation made by the team was that they felt that it didn’t necessarily help them make informed decisions in terms of how to deliver the feature. A while ago, the team stopped using iterations opting for more of a flow based model, we’ve been implying a Work in Progress limit by restricting the amount of streams available to feature work but because of Hidden Work previously discussed, amongst other things, these often failed to focus the team in respect of delivery too. In a recent prioritisation session with the stakeholders it was decided that we would focus efforts on improving the performance of a couple of the endpoints within an API. It was decided that owing to the exploratory nature of the work, the developers undertaking the work would do a time boxed spiked. It was at this point that I started seeing a possible way of getting the team to focus in on a delivery date. At the time, I thought that it would be reasonable to use the data relating to the estimates that we’d previously made to also time box future feature work. As can be seen in the image below, in the team’s dashboard we display the minimum, maximum, and standard deviation (variance) for all features within a T-Shirt size. Extending that so that we used it to make a commitment to our clients / stakeholders that for example, anything deemed to be be a medium would be done in 19 days, the mean for that size. Thankfully, I realised the mistake I was making. I was suggesting that a team should take a piece of work which granted they had done some analysis on, and to make a commitment that they would deliver it in a set period of time. This is tantamount to asking a team to make a commitment at the beginning of an iteration to deliver a certain amount of functionality, based on whatever measure they are using at the time. To tend towards an iteration based delivery mentality is to tend towards one of two types of failure in my opinion: Under Commitment from the team so that they know they have more chance of meeting the expectations placed upon them; good for their moral but not great for the overall productivity. Alternatively, making a commitment which the team has no way of knowing that they can meet which can be demoralising for the team over time. The solution for us was born out of the fact that we keep so much data in relation to the features that we have delivered. Recently, we have started to chart the data in a different manner to the one above, displaying the time taken for all features from when the team committed to doing them, to when they were released to the production environment (i.e. they were done). Visually, this is not necessarily an immediate improvement. The obvious thing that does now present itself though is just how much variance there is in the size of the features that the team is doing. However, it is still just a chart showing a lot of variation which when you consider all the features ever delivered by the team, you would expect and the Standard Deviation which needs no explanation. Some might be questioning what use the above is at all, well the benefit for us is in reinforcing the volatility and inherent risk in any estimate. This is complemented massively by the table below. Above, the information we use the most is Number of Items; the size of sample set, the Average Plus Standard Deviation; the average Cycle Time for an item with an allowance for some risk and the Percentage of Items Greater than the Average Plus Standard Deviation; the risk in using the number as the basis for any estimate. When combined this data allows us to do one important thing for our stakeholders. In the absence of any deadlines we can say that we endeavour to deliver any item according to its type within a certain timeframe (arithmetic mean for the sample set + 1 standard deviation), hence the team are defining an SLA. What’s important to note though here is that the SLA is not a commitment; it is information relevant to the team to enable them to focus on the risk that is always present in delivering software. These dates are being used currently by the the team in planning exercises as indicators and by putting the dates on the cards that go through the wall (using a post-it note on top of the card) to help them focus on delivery and furthermore and perhaps more importantly, to allow them to manage the risk on a daily basis. At the stand up when talking about cards they can focus specifically on how to increase their chances of delivering the feature within SLA. It’s early days for this experiment and there isn’t enough data as yet to suggest that it is either succeeding or failing. Anecdotally though, it seems to be having a positive impact. 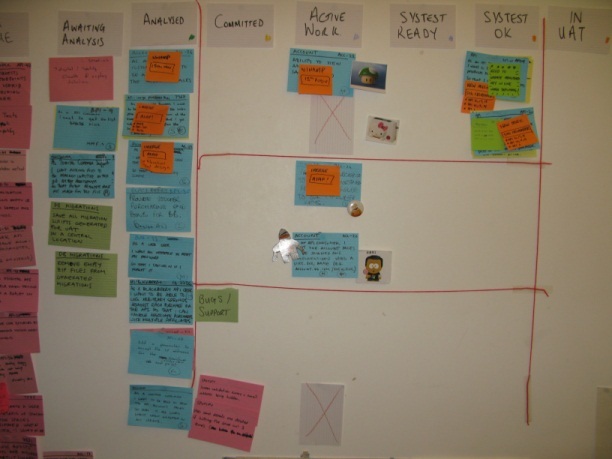 This entry was posted in agile, lean, work and tagged commitment, estimation, sla, time box on 7 April, 2010 by danrough. I had an interesting chat with Steve Freeman at the Limited WIP Society meet this week about the way the relationships within a group change in relation to it’s size during which he introduced me to Dunbar’s Number. Based on my reading so far, Dunbar’s number would appear to be commonly thought to be in the region of 150. In the context of our conversation though, Steve suggested that it was actually a sequence (If I remember rightly 1, 2, 5, 12, 30 … 150) of numbers through which you could identify the points at which relationships within a team change. I’ve always held the belief that in terms of team size, there is a sweet spot of greater than or equal to 5 and less than or equal to 8. I’ve previously observed that a team of less than 5 find it difficult to self organise and whilst I can’t substantiate this, I theorise that it may be possible to tie this back to the work of the likes of Belbin and Tuckman. At the other end of that scale, I think that a team larger than 8 needs to consider further the leadership structure and it was this point in particular that led Steve to raise Dunbar’s Number. Of particular interest to me though is that by coincidence, the department that I work within maps to the sequence outlined above. In the past year our organisation has grown and as a consequence the department has roughly doubled in size. Throughout that growth we’ve made some changes to the way in which the teams are structured going from 3 teams with roughly 4 people on each, to our current state of 4 teams with on average 6 people. We’ve chosen to introduce or at least formalise somewhat the existing Lead roles that we had in place (Rob has previously posted details of the Roles and Responsibility documents that we created at the time for those interested.). Through the processes that we use within the teams, we’ve placed a greater emphasis on communication and I think that is paying dividends. Furthermore, communication at a departmental level is good too. There are of course areas in which I feel we could improve, none of which I can necessarily single out at this stage, it’s my intention to spend some time understanding them more with other members of the department over the coming months. With the probable introduction of another 4 people to the department this year and the fact that that will take us ominously close to a contingent of 30, the next number in the sequence though, I’m keen for my own curiosity’s sake to attempt to measure the effect of any new team members joining. Not only within the context of the team but of the department at large. Which leads me to question what to measure? I’ve previously used rather crude measures such as capacity of the team to do work both in the lead up to the introduction of a new person and for a period of time thereafter (I appreciate now that this was wrong, mapping a team’s productivity to it’s overall well being was naive.). I’m thinking of perhaps using something like the satisfaction chart towards the end of this post though I must confess that the value I think would derive from the data would be questionable. I’ve always quite liked the Pillar’s of Agile retrospective because as a tool it can be used by a team feasibly on a regular and ongoing basis to drive recognition of the results of the continual changes they are making to their practices. I wonder if this could be purposed in a different manner, I can absolutely see it working at a team level, I’m not sure how it would work at a departmental level though. How about you? What if anything are you measuring outside the classic delivery / throughput criteria within your team and or department (in which case outside of appraisals too) that could you point to and say “This event caused this impact on us as a team.”? Does it matter to you that this sort of thing be measured? This entry was posted in work and tagged dunbar number team dynamics social complexity on 15 January, 2010 by danrough.